Strengthening my muscles and getting ripped is not just an exercise for me. It is a habit that I love and I adore doing in the gym. For several weeks now, I wanted to tone and strengthen my upper body muscles in the comfort of my home. For such a purpose, I had to buy my own pull up bar, slip it into one of my doorways and start enjoying a total upper body workout. Initially, I was cautious with such a purchase as the pull up bar market was not known to me. As soon as I started searching, my attention was caught on the “Iron Gym Total Upper Body Workout Bar” which has an amazing design and comes with a good price. However, I felt the need to know more about this device so, I started a research to get as much information as possible. How does the “Iron Gym Total Upper Body Workout Bar” work? In the video below, you can watch a user of the "Iron Gym Workout Bar" giving a review of this fitness equipment. He goes through the whole process from unpacking and assembling this device up to fixing it to his doorframe. With the “Iron Gym Workout Bar”, you can get a full upper body workout in your own home. Bear in mind, that this compact multi use workout bar is designed to fit easily and securely in your door frame without the need for you to use screws or nails. The bar wedges around the frame so, when you finish with your workout, you can immediately store it somewhere in your house. When you attach the bar on the doorway you can perform several upper body exercises. You can do wide grip pull ups, reverse grip chin ups, and close grip pull ups which focus on you back muscles and your biceps.Eventually, these exercises will give you a nice v-shaped back and also muscular arms. Additionally, with the Iron Gym, you get two more grips vertical to the wall for easy reverse pull-ups and the forward facing hammer gripped pull-ups. You can also place the Iron Gym Workout Bar on the floor and use it as a multi grip pushup stand and a triceps equipment. With this way, you train your chest & triceps, your lower abdominal muscles, arms and also your shoulders. It is indeed the complete at home workout package. This piece of fitness equipment is great both for strengthening & toning muscle but also for burning fat too. You have the flexibility to go from one exercise to the other. In that way, you get a bodybuilding workout and a fat-burning exercise, all in one. It is indeed astonishing what one simple exercise equipment can offer to you in the form of a full body workout. What others are saying? Does the “Iron Gym Total Upper Body Workout Bar” work? For such devices, you always think about the setting up but with the “Iron Gym Workout Bar” you do not have to worry as the “assembly is pretty straightforward” and it only takes about 10 minutes. It is also important, that this is a machine that does not get worn out and it “remains solid and without damage” even after very frequent exercise. This equipment does exactly what it claims to do. Indeed, it is a “great buy for the money” that you give and it will certainly not let you down. You do not have to worry about holding your weight as it can “support 250 pounds just fine”, even up to 300 pounds. The “grips are very comfortable” and thus you definitely get an enjoyable, effective and varied workout. At this point, I would like to emphasize that there is no way that the “Iron Gym Workout Bar” will ever cause any damage on your doorframe because it is very “well-padded to protect it”. It is also amazing that the “bar is solid and reliable” and therefore you will never fall over or suffer any other injuries as the bar itself pushes horizontally against the wall. Will the“Iron Gym Total Upper Body Workout Bar” offer you effective workout? I would not hesitate to claim that the “Iron Gym Workout Bar” can literally transform your body. Indeed, at the comfort of your own home you both gain muscles fast, you burn your calories & your fat and you lose weight as well. While exercising, you will be amazed how you can progressively perform more and more pull-ups and chin-ups which mean that you get stronger. You will definitely see improvement to your “upper body endurance strength”. Additionally, this device is also very effective when it comes to permanent back pain as, after regular pull ups and chips ups the “back pain goes away”. The most serious problem with regard to the “Iron Gym Workout Bar” is that your doorframe must be both of a certain thickness, of a certain height and of a certain width as well. Otherwise, it will just not fit. For this workout bar to fit securely, your “doorframe must be 5.5-6.0 inches thick”. Another serious provision for the bar to fit is that the trim around your doorway “must be less than 3 inches”. Last but not least, is that the bar has a rusty look since, “there is paint chipped off” where the bolts go. 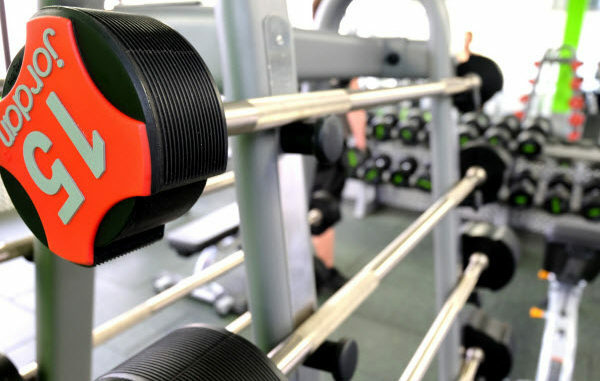 Such a workout bar with a big choice of exercise does not only strengthen and build your muscles. It is perfect for you to burn your fat and your calories as well. Bear in mind that you can do hanging knee raises which will exercise you lowers abdominals and of course, they will reduce and finally eliminate your belly fat. Additionally, the pull ups help you to burn your fat as they exercise your core abdominal region and your upper back muscles. Now that I have to evaluate the customers’ view of this product, I would say that the extreme majority of them liked it. The average customer review gave this product a 4.0 rating out of 5.0. It is also amazing that out of 819 reviews, 453 of them gave the “Iron Gym Workout Bar” a 5.0-star rating and 202 of them gave it a 4.0-star rating. Where can I buy and where can I read more reviews? You can buy this workout bar at a great price on Amazon.com. You can also read more customers’ opinions about this product and find out more about its performance.